China’s Ministry of Defense (MOD) has accused Japan of aggressive behavior in the East China Sea, claiming that Japanese “provocations” nearly resulted in a dogfight between aircraft of the People’s Liberation Army Air Force (PLAAF) and the Japan Air Self Defense Force (JASDF), according to a statement published on the Chinese MOD website. The Chinese claims came a week after Japanese media reported that a Chinese warplane was close to firing at a JASDF aircraft in the East China Sea—an incident that was immediately denied by Koichi Hagiuda, the deputy chief Cabinet secretary and an aide to Japanese Prime Minister Shinzo Abe. The Chinese fighter jets adopted decisive measures such as tactical maneuver and so forth to deal with Japanese fighter jets’ provocations (…) and consequently, the two Japanese F-15 fighter jets flew away after firing infrared jamming shells. The Chinese MOD is urging Japan “to cease all provocations,” and expressed hopes that Japan “will meet with China half way as soon as possible and eliminate obstacles in negotiations so as to create conditions for launching and operating the China-Japan Maritime and Air Liaison Mechanism,” according to the July 4 statement. As I reported previously, during fiscal year 2015 the JASDF had to dispatch its fighter jets 571 times to intercept Chinese military aircraft approaching or intruding Japanese airspace — an all-time high since Japan’s Ministry of Defense’s Joint Staff Office began to keep records in fiscal year 2001 (See: “Japan’s Fighter Jets Intercepted Chinese Aircraft 571 Times in 2015”). 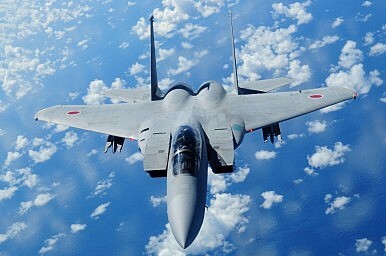 In February 2016, the JASDF stood up the new 9th Air Wing consisting of 40 Mitsubishi F-15J all-weather air superiority fighters at Naha Air Base, located in the capital city of Okinawa, in order to prop up the defenses of the Ryukyu Islands chain, a move widely seen as a response to China’s growing military assertiveness in the region (See: “Japan Forms New Air Wing to Fend Off Chinese Advances in East China Sea”).